FREE SHIPPING! 1-3 DAY RUSH PROCESSING AVAILABLE! PHOTO PALLET SALE! 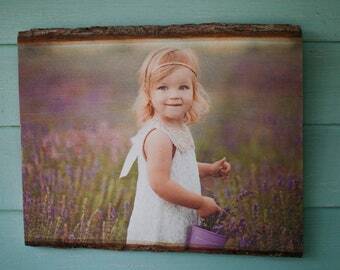 Your photo printed directly onto a beautiful high quality, handcrafted pallet made from thick premium wood. Natural jute wall hanger included! Custom Sizes available! We strive to create the highest quality wood photos. Our photo pallets are handcrafted from scratch in our workshop and printing facility located in Virginia. Each pallet slat is cut from thick Grade A, hand selected, Baltic White Birch and then sanded by hand to prevent chipping (a defect often passed-on as "rustic"). Pallets are then assembled and your photo is printed onto and sealed into the surface. Our printing process allows the wood's natural grain and mineral deposits to show through the photo making each piece unique. Because we are involved in each step of the creative process, we can assure the highest quality photo pallets at a low price, as well as guarantee our work. 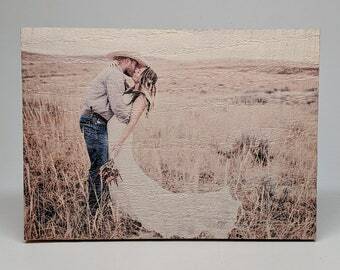 A photo pallet from MyWoodPhoto is a truly handmade piece of art. We offer a variety of stocked Standard Sizes and offer Custom Sizes as well. 4x6" Mini-Pallet (2-Slats) - 6x6" - 8x8" - 8x12" - 12x14" - 12x18" - 18x20" - 18x24" - 24x26" - 24x30"
*Due to weight, jute hanging string is not recommended for our oversize 24x26 and 24x30" pallets. Pallets of this size will come with heavy-duty hanging hardware. If you would still like jute string let us know at checkout and we will add it at no additional charge. We can create wood photo pallets in any size. Please contact us for details and pricing. CUSTOM TEXT can be printed on the back of our pallets (100 character limit). Text will be printed smaller on 8x12" and vertical photos. Text is not available for 4x6" 6x6" or 8x8" pallets. 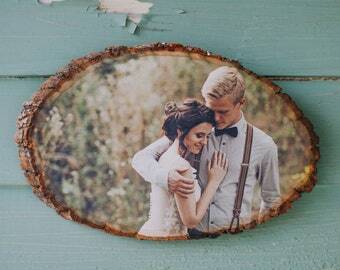 When a photo is printed onto wood the image absorbs some of the natural wood color. Our Color Enhancing service involves a process of whitewashing the wood prior to printing. This allows the color of the image not to be absorbed by the wood. The result is a wood photo with colors that are brighter and more striking while retaining the natural wood grain which makes the piece unique. We are happy to add a FREE PERSONALIZED NOTE with the order for the recipient. Simply write what you would like to say in the "Add a Note" section at checkout. We hope that you will feel pleased knowing part of your purchase goes directly back into the environment through a reforestation that is double what was used to make your wood photo pallet! 1) Pick the size and quantity you would like and purchase this listing. 2) Attach your image in an Etsy message to us and we will immediately begin the process of making your wood photo pallet. 3) Once complete, we securely pack and offer FREE SHIPPING for each order! Please feel free to ask us any questions you may have. We look forward to making your wood photos! Excellent, everything shipped promptly and was as advertised. All major Credit Cards, PayPal and Etsy Gift Cards. Inquire about Money Orders and Personal Checks. 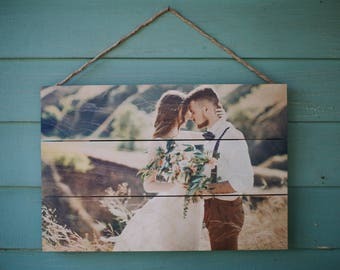 Even though your wood photo is a custom item, if you are not 100% happy with it we gladly accept returns as long as we are contacted within 3 days from the time delivery confirmation shows delivery. Sales past this time are final. Return of 100% of the purchase price will be applied once item is returned (shipping excluded). Shipping charges and Rush Upgrades are non-refundable. Buyer is responsible for return shipping. In the event that an item is returned during a free shipping promotion the original shipping cost will be deducted from the refund. Completion times vary due to the time of year. Orders begin once payment has cleared and we receive photo(s). Our completion and shipping/transit times are an estimate only. If you need your item by a specific date please contact us ahead of time for rush order options, otherwise all orders are strictly made in the order they are received. We offer FREE Standard Shipping for all domestic orders (5 to 10 Business Days approximate) and offer shipping and processing upgrades at checkout for those who need their order sooner. Rush Processing is a service for customers who need their order in-hand in about a week or less. Our Rush Processing includes two upgraded services (processing and shipping). Once we have a workable photo and customer approval on optional text proofs, orders are then completed within 3 Business Days and include an upgraded Shipping time of approximately 1-3 Business Days. We are proud to offer International Shipping to Canada for a flat $9.99 USD. International order transit times vary. Please inquire for details. All orders are packed securely and include tracking and insurance. However, in the unlikely event that an item should arrive damaged, insurance claims will be handled by us and we will make a replacement at no charge to you. To date we have not had a wood photo arrive to a customer damaged. *Please make sure the shipping address on file is correct* There is a $20 charge for orders that are undelivered or returned due to an incorrect address. This covers the shipping charges, repacking/handling, and remaking entirely of the product(s) when applicable. *All address changes must be requested within 24 hours of order placement. Requests made after 24 hours may be sent to the address on file at the time of order. We believe in supplying customers with accurate photos and an honest description of what they are purchasing. All wood photos displayed on our site were made by us and are a faithful representation of the quality of our work. Our images of wood photos are not photoshopped or enhanced in any way. For best results we recommend using the photo as close to the original source as possible. Images taken from social media sites, screenshots of images, and thumbnails may not print well on some of our larger wood products. Darker photos will show less of the wood's natural grain and mineral deposits. All photos are printed as they are sent to us, for example, horizontal images will be printed horizontally and vertical images will be printed vertically. There may be cropping along the edges and corners to accommodate product size. Due to cropping, centering, and pallet gap placement issues we cannot print photo collages and do not recommend images with text or writing of any kind. We reserve the right to crop and/or change the centering of an image to help with pallet gap or live-edge (bark) placement. For round products we recommend photo subjects not to be on edges or corners as there will be cropping to accommodate the circular shape. Images used to make wood photos displayed on our site are from customer orders. If you would like for your completed wood photo not to be used on our site or in our portfolio please let us know at time of purchase. Customer is solely responsible for the images they upload and warrant that they own the copyright to the images and release MyWoodPhoto from any infringement claims. Our regular operating hours are: MON-FRI 6AM - 4PM EST. Messages are answered during regular business hours. Photo Pallets - 4x6" - 6x6" - 8x8" - 8x12" - 12x14" - 12x18" - 18x20" - 18x24" - 24x26" - 26x30" as well as custom sizes. Live-Edge Rustic Rounds - 6 to 12" as well as custom sizes. Live-Edge Rustic Planks (rectangular) - 13" as well as custom sizes. 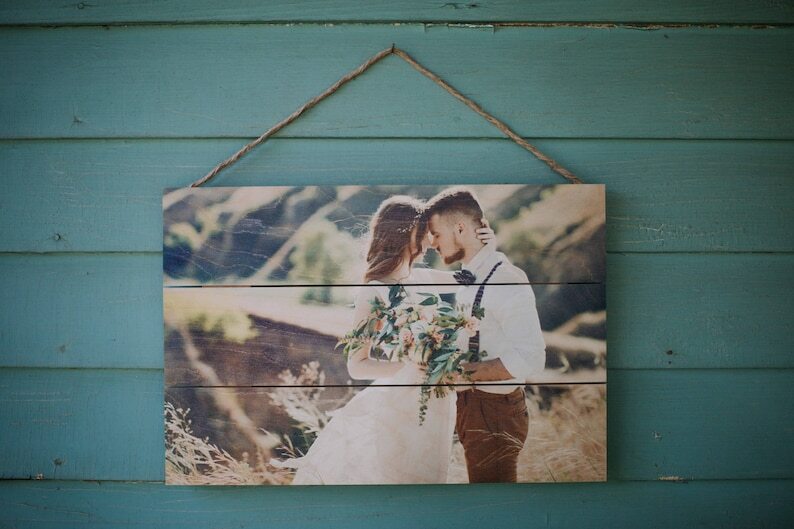 Barnwood Photos - various sizes, while supplies last (discontinuing). Shipping upgrades and Rush Processing available at checkout. * All sizes are in width or height, depending on the direction of your photo and are approximate. You can attach your photos in an Etsy message to us. Can you print a collage? As of June 2017 we no longer print photo collages. This is due to cropping issues. We can only print one photo per piece. Can you email me a photo of the completed piece? This is a service we used to offer, however, due to the custom nature and high sales volume of our products we are no longer able to send photos of the completed product prior to shipping. We do guarantee our work and will work with customers if they are unhappy, for any reason, with their purchase. Our goal is always 100% customer satisfaction. Can I send a physical copy of my photo to you through the mail? We used to accept customer's images through the mail and scan them, however, we are no longer able to offer this service due to new equipment and processes that we have. Can I add text to the front of my wood photo? We do not recommend photos with text on the image due to cropping issues. We do offer a text printing service for the back of most of our products to further personalize your handcrafted wood photo.